Spider Tortoises belong to the family Testudinidae. 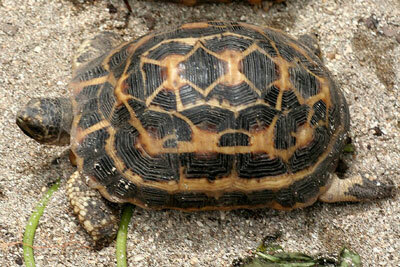 This species of tortoise Pyxis arachnoidesis endemic or confined to Madagascar. The genus Pyxis has only two species.Arachnoides are one of them. This is an endangered species. There is not much info about the life cycle of this tortoise species. Many believe that they live up to a maximum of seventy years, even though their normal life span is reported as around 40 years. You scan find these tortoises only in southwest Madagascar. The spiny vegetation of the sand filled coastal area is their habitat. They feed on tender leaves, larvae of insects and animal droppings. The eye-catching spider-web patterns that decorates the shell of the species are their boon and bane. The tortoise gets its name from this pattern. They are much in demand in the exotic pet trade. This is the main reason for the reptile’s present precarious situation. Spider Tortoises are small reptiles. They sport highly curved oblong shells that broaden towards the rear. The adornment of the shell consists of five to eight yellow lines that appear to radiate from a yellow center, against a very dark brown/ background. Sometimes, the background is black. The plastron or lower shell, has a yellow color. The head appears to be dark with yellow speckles. The male’s tail is thicker and longer than the female’s, and the tip is much harder. We can find the spider tortoise at its active best during the wet months from November to April. At this time, the vegetation is comparatively more abundant and the tortoise can splurge on fresh grass, tender leaves, the succulent plant roots and the insects lured by the blooming plants. They even feed on animal droppings that contain insect larvae. When the dry season commences, many of the tortoises burrow deep into the sand to aestivate (as opposed to “hibernate," which is for the duration of winter). This is definitely an energy and moisture saving survival tactic for times when food and water are scarce. 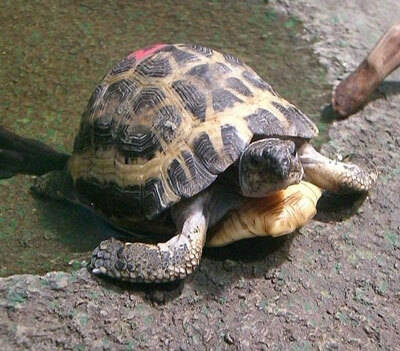 You cannot find much information about reproduction in Spider tortoises. Perhaps they mate when the rainy season commences. A female lays just a single egg, according to some. The females in captivity, lay eggs about three times in a year. It is not clear whether this is a true reflection of how they behave in the wild. The incubation period is 220 to 250 days for the eggs. When the hatchlings emerge, they are very tiny, just about 4.5 centimeters in length. They mature at six or seven years and have a slated life span of about 40 years,. However, there are reports of Spider tortoises living up to a maximum of 70 years. 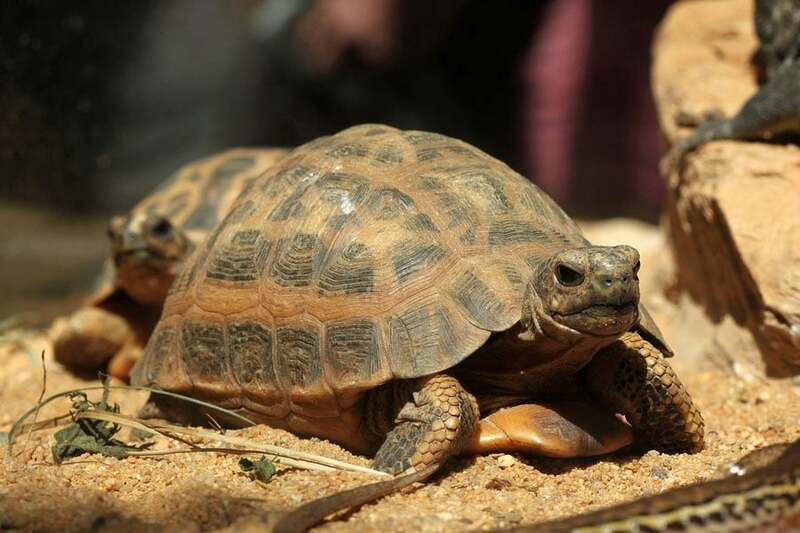 These Spider Tortoises live in the arid coastal areas of southwest Madagascar. They range from the coast up to around 20 kilometers inland. Originally, the species spread over a 555 kilometer coastal stretch. The range has become very fragmented because of poaching and destruction of the habitat. The subspecies are divided geographically across the range, with Pyxis Arachnoides Arachnoides holding the largest and the most central range of all. The habitat of the spider tortoises is mainly the semi arid Mikea forests on the northern side and the dry forests of the south. The habitat generally consists of sandy soil and low vegetation of mostly succulents and spiny shrubs. The varying canopy cover levels aid the tortoises in thermal regulation. They generally inhabit areas that have 30 to 50% Canopy cover. 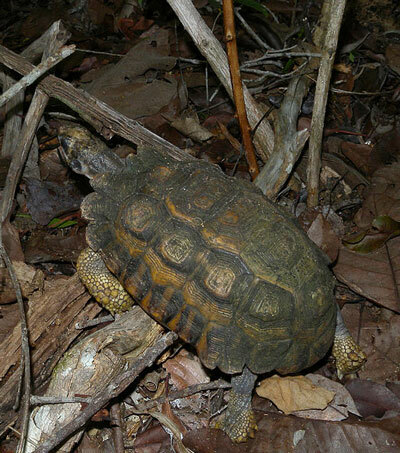 These spider tortoises exist in three subspecies across their 500 square kilometer forest range habitat. The northernmost subspecies are thePyxis Arachnoides Brygooi, the Pyxis Arachnoides Oblonga in the south and the Pyxis Arachnoides Arachnoides mainly occupying the central part near the Onilahy River, near Toliara, and also represents the largest population of these tortoises in the region as a whole. Habitat degradation is a major threat. The loss of habitat is estimated at 1.2 % per year. A lot of factors contribute to the habitat loss in Madagascar. Firewood exploitation, man made fires, charcoal production and conversion to agriculture along with invasive types of alien plants have all contributed to the degeneration of the habitat of these species. The human population boom in Madagascar has only worsened the situation. Along with the threat of habitat loss, another compounding problem is illegal harvesting of the species for the international pet trade. Spider tortoises are immensely popular in the international pet trade due to their small size and attractive shell. Just imagine, in 2001 one trader placed a single order for 10,000 spider tortoises!. There is a ban on international trade of spider tortoises under CITES. In spite that, illegal collection of the species is going on unabashed. They are smuggled out of Madagascar to the pet markets of Japan, US, Europe and southeast Asia. Near the north of the range, people harvest these species locally for consumption. Probably the most threatened of the subspecies are Arachnoides Brygooi . About 50% of the species have disappeared from their range. National law protects this Critically Endangered species in Madagascar. The CITES has listed the spider tortoises on Appendix I. This prohibits the International trade of the species. There is an urgent need for a specific action plan for the conservation of the species and stringent measures aimed at protecting the habitat of the Spider Tortoises. These tortoises are not meat eaters. You can feed them all kinds of vegetables as well as fruits. Spider Tortoises get tired of their food so easily that you have to give them a wide variety in diet. You should finely chop the food that you provide to make it easy for them to eat. These tortoises will drink directly from a water dish. You should make sure that fresh, clean water is available all the time. Being relatively small tortoises, they do not require large areas for housing, unlike many other species. These tortoises need a high temperature gradient. 85 degrees F at the warm end and 65 degrees F at the cooler end. A level of 75% humidity would be ideal for these pets. Bark chips or materials of that sort will suit the Spider Tortoise enclosures. Always remember that the spider tortoises are an endangered species. These tortoises are among the smallest in the world. Our articles are free for you to copy and distribute. Make sure to give Learn About Nature credit for the article.